Ed Carter, communications professor at Brigham Young University, hosts a subpoena panel discussion of attorneys on Sept. 18 at the university. 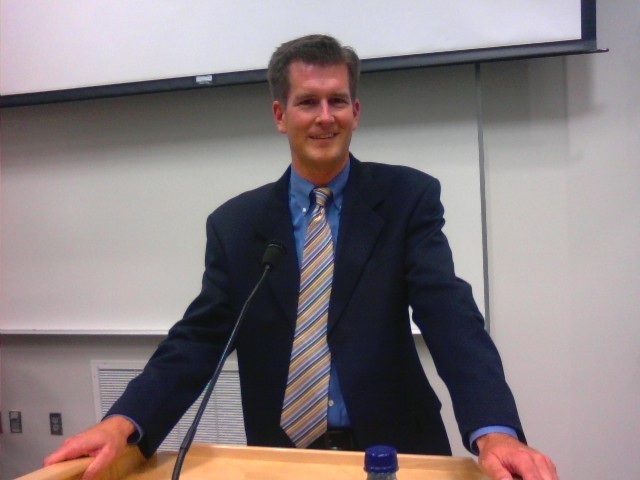 Carter has been an instrumental member of the Utah Chapter, Society of Professional Journalists. Attorneys speaking on a subpoena panel titled “Protecting Confidential Sources,” hosted by Brigham Young University, Sept. 18, from left: RonNell Anderson Jones, associate professor at BYU’s J. Reuben Clark Law School; media attorney Jeff Hunt, of Parr, Waddoups, Brown, Gee & Loveless, in Salt Lake City; and attorney M. Dayle Jeffs, of Jeffs & Jeffs in Provo. 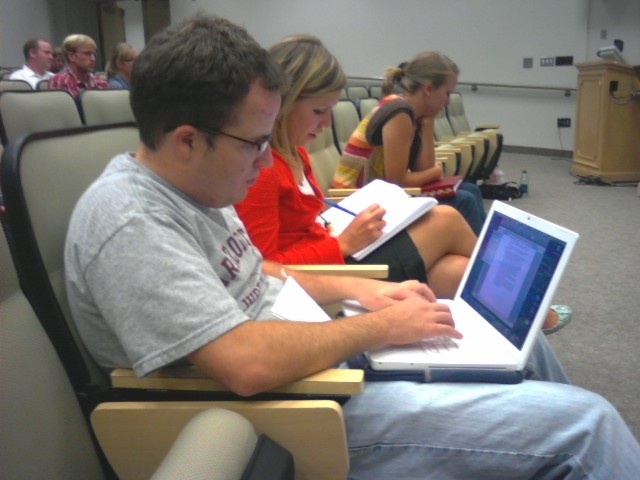 Brigham Young University print journalism students take copious notes during a subpoena panel discussion on Sept. 18 at the university. From front to back: Sean Walker, 23, of Provo, a senior; Emiley Morgan, 22, of Greeley, Colo., a senior; and Rachael Oborn, 21, of Montgomery, Ala., a junior. Brigham Young University communications professor John Hughes asks a question to attorneys speaking on a panel Sept. 18 at the university. Hughes is a Pulitzer prize winning journalist, and former editor of The Christian Science Monitor and the Deseret News. The rise of subpoenas, how Utah’s shield law (Rule 509) came into existence and the hope for similar federal legislation, all served for hefty discussion by a panel of attorneys familiar with media issues. 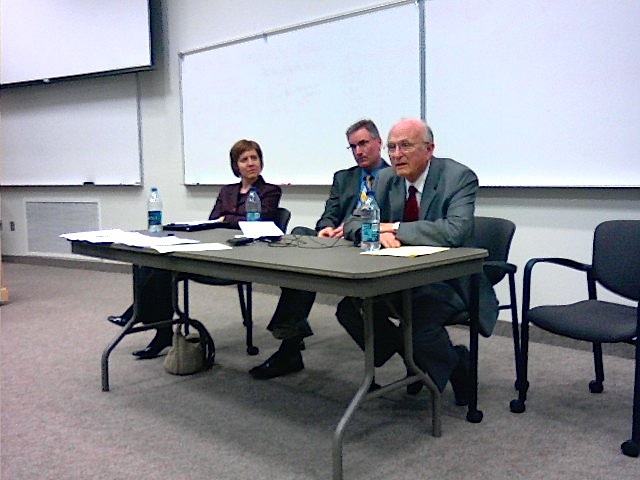 The panel, titled “Protecting Confidential Sources,” was at Brigham Young University in Provo, Utah, on Sept. 18. 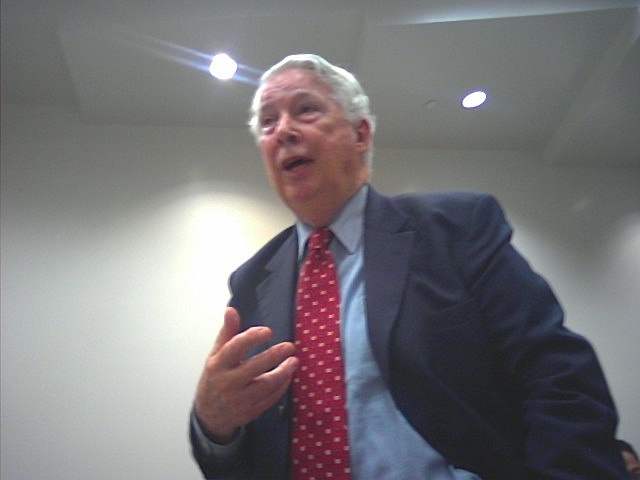 BYU Communications Professor Ed Carter, a key member of the Society of Professional Journalists, Utah Chapter, hosted the event. Speakers were: Attorney M. Dayle Jeffs; media attorney Jeff Hunt; and BYU associate professor of law RonNell Anderson Jones. In the last few years, a big issue in the world of journalism has boiled over: the increase in subpoenas that seek confidential sources and news gathering information from reporters. “These (subpoenas) threaten journalistic independence and post an obstacle to the vital function played by journalism in a democracy,” Carter said. Journalists enable democracy and the search for truth, as well as provide a check on government. Currently two-thirds of the states have a shield law which protects journalists from revealing confidential sources. The idea of the legal privilege is to excuse testimony in legal proceedings. The United States has yet to adopt a federal shield law. Subpoenas to the media are increasing at an alarming rate, Jones said. An estimated 10,000 subpoenas were received by daily newspapers and network-affiliated television stations in 2007, according to statistical data Jones gathered. Earlier studies found an average of 2.6 subpoenas per news organization each year. Jones’ 2007 study discovered 4.02. Contrary to what the Department of Justice believes, subpoenas to media are increasing, Jones said. A total of 64 newsroom leaders stated they believe subpoenas are increasing compared to five years ago, she said. Hunt said prior to January 2008, Utah was only one of three states that had no reporter’s shield law. There was no legal protection for reporters, sources or news gathering. The media formed a coalition and went to work. Jeffs and other attorneys on the Utah Supreme Court advisory committee hashed the issue in long monthly meetings. The committee comprises 18 people including three judges, along with attorneys in various fields. Utah Attorney General Mark Shurtleff came out in favor of the proposal. Law enforcement deals with confidential sources as well. He knows the sources need some measure of protection or they won’t come forward. The free-flow of information is at the heart of the matter, Jeffs said. “Great things would be lost if that is compromised,” he said. Eventually Rule 509 was presented and adopted by the Utah Supreme Court. “Now it applies with the same force as law in the state of Utah,” Jeffs said. Hunt said he feels strongly shield laws serve the public interest. They protect the free flow of information to the public by giving some measure of protection to news sources that their identities will be kept confidential when reporters make a promise of confidentiality. Reporters will make promises to protect their sources. When they have the backing of the shield law, it gives legal force to their promises. This will encourage people who have knowledge of wrongdoing, either in government or private business, to come and provide that information, Hunt said. A future federal shield law? Although a proposed shield law floundered in the Senate before summer recess, there is hope for a federal shield law this year, Jones said. “Maybe it will follow the pattern of Utah,” she said. Both major presidential candidates, McCain and Obama, have signaled their support for a federal shield law, Jones said. “This is a new development,” she said. The Bush administration did the “diametric opposite.” When a version of the bill passed the House last fall, the Bush administration issued a press release strongly suggesting the president would veto this legislation. “Hope lies on the horizon for a federal shield law,” Jones said. Media attorney Jeff Hunt, of Parr, Waddoups, Brown, Gee & Loveless, in Salt Lake City. He practices in the area of commercial litigation, with a particular interest in First Amendment, media and intellectual property law issues. He has worked as a reporter. Attorney M. Dayle of Jeffs, of Jeffs & Jeffs in Provo. He has been a member of the Utah Supreme Court advisory committee on the rules of evidence since 1988. He and the committee conducted a lengthy study of Rule 509 — reporter’s privilege — that was ultimately adopted by the Utah Supreme Court earlier this year. RonNell Anderson Jones, associate professor at BYU’s J. Reuben Clark Law School. She has worked as a reporter and served as a clerk for Supreme Court Justice Sandra Day O’Conner. She has been gathering data on media subpoenas.